In the absence of Triskaidekaphobia, and with an admiration for Friday the 13th, my wishes were always with something with a “13”. That makes the KL-13 registration of Kannur significant and something special. The theory that Jesus Christ’s last supper, there was the presence of thirteen people around the table, including Jesus and the twelve apostles – doesn’t really make the number 13 unlucky, for it was a presence which made the God’s will possible. The presence of that exact number of people led to the calendar being separated by BC and AD. The fact that King Philip IV of France ordered the arrest of the Knights Templar on a Friday 13th was just an incident of history. Our Lady of Fátima apparitions to three shepherd children at Fátima, Portugal was on the thirteenth day of six consecutive months in 1917, beginning on May 13. Saint Anthony of Padua also has his feast on June 13th, and the number being associated with him would just make it more important; famous and not notorious. A traditional devotion known as the Thirteen Tuesdays of Saint Anthony involves praying to the saint of Padua every Tuesday over a period of thirteen weeks. Another significant devotion, Saint Anthony’s Chaplet, consists of thirteen decades of three beads each. Keeping all these in mind, one can only feel that the number 13 has been thus elevated and honoured beyond the materialistic world, and to the District 13, I had to go. This was a remarkable journey in many ways. A road trip from Kannur to my hometown would be the longest route I have ever taken in my life in one stretch without stopping for more than just a tea or two. It was also that test which my car had never taken before. The largest city in North Malabar region and the sixth largest in Kerala proved to be one of the worthiest destinations, as surrounded by history and geographical beauty. The Land of Looms and Lore was a destination which I should have visited long ago. Did I need inspiration to visit such a good destination? What took me so long is a question which is more rhetorical than anything else. But the fact remains that I was late and I would surely admit that. But being late has its charms; and being early always has so many negative things. This late-Kannur-coming was more positive than any other early visits to the other places. It created more wonderful moments than what was possible if the journey had happened long ago. St. Angelo Fort deserves the first mention, not only as one of the most important seashore forts of South India, but also as a former stronghold of many powers, the Portuguese, the Dutch, Arakkal and the British. It is one of the earliest Portuguese settlements on this side of India. 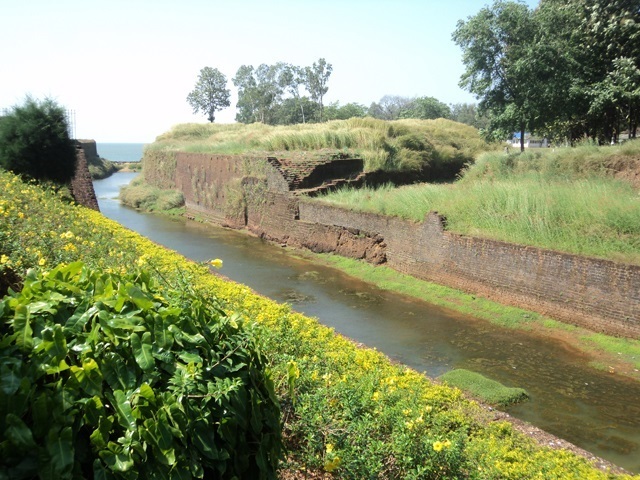 Built in 1505 by Dom Francisco de Almeida, the first Portuguese Viceroy of India on the Arabian sea coast, only about two or three kilometres from Kannur town, is a strong defensive position as it proved during the Siege of Cannanore in 1507. The Dutch capturing the fort is more of a sign of its strategic importance than its weakness or inability to defend. Its significance can only be overtaken by its beauty. It has more than one entrances and the inside of the fort is beautifully preserved. There are cannons and greenery around, and those old structures are well preserved. There are also the beautiful flowers and the well-maintained trees which add the much needed looks to the historical and cultural interest. The cannons which face the outside, towards the sea, gives the visitor an idea of how the battles used to take place and how well the fortress has served as a fantastic defensive position for the Portuguese and the later owners. The look from the top of the fort gives another perspective of the sea. What I could see was a version of “The Old Man and the Sea”, not of Ernest Hemingway; and “The Riders to the Sea”, not of John Milton Synge and not of Latin America or the Aaran Islands. There was one lone fisherman on the rock, which was somewhat away from the land, like a very small island. This was more of reality than fiction, not free from cruelty, but close enough to truth. The scenes were always thought-provoking. The yellow flowers which lead the sides of the watery path to the sea; what a sight it would provide! The imagination brings ships or boats through that watery path triggering an invasion of the mind, a nightmare of creative vision which is no less than a powerful creation of fictional conquest – no vanity there. Who would want to leave that one fort? Who would not have wished to conquer the fortress? One can’t really blame the Dutch or any of those conquerers in wishing to live in the glory, safety and beauty of such a place. What poetry or prose might have the structure inspired and was later lost in the seas during a return journey to Europe? At the bottom of the saline waters, what might the future find more than a question? Not of my authority to answer. There was the Hebich’s Church which was found looking for the Kannur Cathedral. The Holy Trinity Cathedral was still not be hidden for that long time, as its looks were not to miss getting caught in the eyes of the common man. There was a cone on the front and a dome on the back; there were small cones all around and the inside was in no way inferior to what was on the outside. There was one tree quite close to the church building and it reminded more of Samuel Beckett’s “Waiting for Godot”, if not about T.S. Eliot’s “The Wasteland”. It looked quite dead at that time, or may be it had just shed all its leaves. But when caught in the camera with the cathedral’s dome, it created a good shot. But there was no Vladimir, Estragon, Pozzo, Lucky or even the Fisher King to be found nearby. No they hadn’t gone to Payyambalam Beach, as I was there too. It was one of the most beautiful beaches around, and the area around it which looked like a lagoon, was even more beautiful with the support of the rich greenery. The rocks, coconut trees, sands, sea weeds and the waves had created a scene of natural beauty which would inspire the best of mermaids. The Cannanore lighthouse is also located near the Payyambalam Beach. There is no surprise about that one though; the existence of the beacon at this location can shock not many people of this world and the other. Meenkunnu Beach and Thottada Beach are also to be kept in mind on such a journey. But what strikes the most might still be the blending of history to the nature, this time with the sands of many beaches – resembling the sands of time which continues to disappear into that void of worthlessness, that black hole filled with white sands. The Prince of Persia was surely not the one person to understand the importance of time, and the total number will not be limited to a few. The hourglasses will continue the job and the world will continue to have its not-so-Persian princes. One can bid adiue to an ancient sea port, but how long until it fades away? The centuries of history would support the cause of the sea port to live in the minds of people. What about Thalassery, Mahe and Muzhappilangad? That would be another story, or more than just one tale of travel. For now, the world revolves around one sea port.